“Tempus Fugit.” Um, Is This Going To Be On The Test? This evening ol’ Robbo was mapping out in his brains the logistics of transporting the gels to and from school over the course of the next couple weeks. But aside from the technical arcana of who-needs-to-be-where-when, what really weighs on my mind is the speed with which all of this has come upon us. It really and truly feels as if it was just yesterday that we were packing them all off with brand new books and supplies to their first days of class. And I am positively gob-smacked that the year has blown by in such a flash. I honestly cannot think of any other academic year that, in retrospect, has whirled away in such a blur. I hope that this is just a product of the particular circumstances that have imposed themselves upon the denizens of Port Swiller Manor this year. I haven’t talked about them much here, but in the past nine months we’ve had a death in the family and several major health issues which, combined, have taken up a goodish bit of our time and attention, not to say our energy. Thinking on it, I like to believe that distraction by these circumstances has been a major player behind the telescoping of my perceptions. The alternate explanation – that Robbo is just getting old – is one that I don’t particularly care to contemplate. Over this past weekend, ol’ Robbo found himself rereading for the umpteenth time George MacDonald Fraser’s Quartered Safe Out Here, his memoir of his service under Slim in the Burma Campaign of WWII. At some point in the book – and I’m not going to go hunting for it now because I want to finish this post and go catch the Nats’ game – GMF mentions a scene from an American film called Air Force, a picture actually made during the height of the War, in which a gunner on a B-17 chuckles as he informs his Captain in rayther stark terms that he’s just set a Japanese fighter on fire and it’s going down. The point of the mention was a comparison of racial attitudes towards the Japanese during the War and what would be acceptable nowadays. Well, wouldn’t you know it? In honor of Memorial Day, TCM (I think it was) aired that very film on Monday evening. Ol’ Robbo savors these little grace notes of interconnectedness. I strongly suspect that if one were to do the math, one would find that there are a great many more of them than one might otherwise have thought. It’s rah-rah propaganda and high-flying action coupled with a depictions of the bonds and rivalries among a small unit of military men, coupled with standard outlier story lines concerning the love interest of the bombardier and the crew chief’s worrying over his officer son stationed in the forefront of the battle. (Spoiler alert, but I believe both the love interest and the chief’s son cop it.) There’s nothing particularly outstanding about the film, but if its purpose is to be a statement of American values and perceptions in the early 40’s, then it certainly does its job. For me, the best parts were, shall we say, probably not what Hawks had in mind. For one thing, there were some delightful historickal inaccuracies. Por ejemplo, in the film, the bombers fly into Pearl and the surrounding fields in the dark, greatly adding to the suspense over their landings. However, the Japanese attack commenced at 8:00 ack emma, local time, well after the sun had come up. Then again, in the film we are shown squadrons of Bell P-39 Aeracobras defending the Philippines during their fall in 1941/42. I am enough of a history geek to know that this is inaccurate. However, since I liked the film as a whole, I smiled over this rayther than ranting. For another, there was that curious unevenness of special effects that I have observed in more than one film of the period. You know, the strange admixture of actual aviation footage and cheap models. (See Only Angels Have Wings, another Hawks production.) And in one scene where the “Mary Ann” is being attacked by Jap Zeroes, the fighters hung around just outside the windows so stilly and so long that the bomber crew could have hit them with flung bricks had it had them to hand. As Basil Fawlty said, just trying to enjoy myself. Last week the middle gel came home with a cutting for Mrs. R from what I suspect is a hydrangea. (I’m really only familiar with the oak-leaf variety and this seems to be one of the spade-leaf kind.) She stuck it in a cup of water and set it on the kitchen windowsill. A few days ago, I noticed that it had sprouted some long, fine roots, so I moved it from its cup into a pot full of Miracle-Gro. The cutting seemed happy enough with this, so yesterday I moved it out on to the back porch at Port Swiller Manor. I dunno if it was the direct sunlight, the chilly temperature or the brisk breeze, but within an hour or two, the cutting made plain that it was not happy with this new setting, curling and drooping its leaves in an ominous way. I brought it back inside and put it back in the kitchen, where it once again seems to be content. I’ve never worked with cuttings before, but my suspicion is that this one hadn’t had time to really establish its root system to be ready to face the change in climate. Does this sound right? My instinct is to wait until it actually starts showing signs of growth before trying to move it again. Somehow, this little episode meshed in the mind of Robbo very nicely with another one from yesterday. The 10:30 Mass at my church ran way, way long – it was the first Mass said by a very recently elevated priest who had been a deacon at our church for some time, and it seemed as if half the county had come out to participate. The result was that us noon rad-tradders spent a good bit of time hanging about and waiting for the crowd to disburse before we could go in. I found myself chatting with a woman who I’ve always thought of in my mind as Miss Marple’s Crabby Elder Sister. I’ve sat next to her nearly every Sunday for the past five-plus years now. In fact, it was from listening to her that I learned how to chant properly, eves-dropping madly in my early days as I floundered to find my own voice. But it is only within the past couple of months that we’ve had any kind of social contact. Indeed, I still don’t even know her real name. And I guess that’s the tie-in with the hydrangea cutting. It’s a mistake, I think, to get too worked up over the grand strategic situation, or to forget that God’s real work is being carried out daily on a much smaller, more subtle scale. And it’s a reminder that I should be paying the most attention not to what I read on the innertubes or in the papers, but instead on what’s immediately in front of me. Anyway, just thought I’d share that. A distinctly chilly and brisk – albeit sunny – Memorial Day weekend is underway here in the neighborhood of Port Swiller Manor. Personally, I blame ManBearPig for this latest evidence of global warming cooling weirding weather. Help me, Algore! You’re my only hope! As I mentioned over at Facebook t’other day, it turns out that we get get a pass on this year’s Great Cicada Outburst – apparently, the footprint of this particular hatching brood only gets into the southern part of our county and we’re at the northern end. I haven’t heard so much as a single one, nor have I seen any on the wing. The gels, when they learned the nooz, were ecstatic. And I must say that I don’t miss ’em myself. One of Ma Nature’s more disgusting and pointless experiments, in my opinion. Speaking of Ma Nature, I noticed a funny thing this morning. As regular friends of the decanter are aware, ol’ Robbo has posted here from time to time of his fondness for catbirds, of which there are quite a few in our neck of the woods. Now, heretofore in the song department I had always thought that they pretty much confined themselves to their cat-like mewing and that it was their cousin the mockingbird that specialized in improvisational riffs. Yet as I glanced out the kitchen window at the rising sun, I beheld and heard a catbird sitting on the porch rail and going twenty to the dozen. Have they always been able to do this? Do any of my fellow swillers know the name of those very, very small spiders that weave very thick and gauzy tent-like webs? This seems to be rayther a bad year for them in my clematis and climbing rose, bad enough that I feel I may need to intervene chemically. Well, this being Memorial Day weekend, the streets round here are filled with fat, bearded guys with tattoos riding big ol’ hawgs and making a lot of noise. Where did this custom arise? It’s a Vietnam thing, isn’t it? And speaking of which, I have seen the expression, “All gave some, but some gave all” floating around the innertoobs the past few days. I like it and I hope all of you will remember to raise a glass to those who didn’t make it back. Despite my lack of posting on them, Ol’ Robbo has, of course, been keeping up with the various firestorms occupying the nooz and commentary outlets (at least those not otherwise distracted by this Justin Bieber person and other shiny things.) As I’ve said before, I won’t comment on any of them here since I am a bit too close to the matter for gratuitous observation to be in any way, ah, healthful. I will simply say that I realize more and more the pure yet subtle viciousness of that Chinese curse about living in interesting times. No, instead I will relate a curious thing that happened to me today. Indeed, the second one, on the way home this evening, barely counted. A woman in an SUV two cars in front of me came over a little rise to discover the traffic stopped in front of her. She couldn’t quite come to a stop in time and wound up tapping the car in front of her. There was no damage that I could see as I slid by a few minutes later. On the other hand, the first one was positively entertaining. I was sitting behind a dump truck at a light this morning, preparing to make a right turn. To our inside right, also preparing to turn, was a Jerk Store denizen in a Beemer SUV. He had been surfing in and out of traffic much to my annoyance for a couple blocks. When the light turned and we started to move forward, Jerk Store Boy tried to rabbit out and cut across in front of the dump truck in order to get over to the left. Well, Jerk Store Boy misjudged it, and the dump truck driver either didn’t see him or didn’t care, because when the truck came round the turn, its front end caught the Beemer in the right rear bumper with a most impressive bang! The thing looked pretty crumpled as I slid by in the ol’ Wrangler and proceeded on my way. I confess that I snickered. I’m a pretty aggressive driver myself but I’m not a jerk about it. And although I know that schadenfreude is sinful, I can’t help indulging in it when I see jerk drivers come croppers for their jerkiness. Greetings, my fellow port swillers and good news! Regular friends of the decanter will recall ol’ Robbo’s post of t’other day about the pair of bluebirds that seemed to have taken up residence in the birdhouse attached to the porch support that is soon to be done away with and his fretting over what to do about it? Well, this past weekend, I noticed that said bluebirds did not seem to be hanging around anymore. Perhaps they reckoned the neighborhood a wee bit too crowded, as I had surmised. Late on Sunday, as I fired up the Weber in preparation for grilling some burgers, I wandered up to the birdhouse – which plainly had a nest in it – and gently tapped on the side with a long stick. I tapped again, somewhat more vigorously. I gave the house a fairly substantial whack with the flat of the weapon. It maintained its obstinate passivity. Finally, I unhooked the house from teh pillar and peered in. The nest, based on the dry, crackly state of its component twigs, obviously was not fresh, but was of one or more years’ vintage. Furthermore, there was nothing in it. Not a hint of recent occupation. I heaved a sigh of relief over having dodged an ugly conflict and quickly moved the birdhouse to a quiet corner of the fence. There is much to be said for problems that take care of themselves. T’other evening, on a relatively rare date, Mrs. R and I paid a visit to the local planetarium in order to take in a show on black holes. I would guess that I was considerably younger than the youngest gel the last time I sat down under the dome. You may snicker behind the decanter and mutter to each other under cover of the cracking of walnuts, “Sink me, do these people know how to party or what?” I will say in defense that a) Mrs. R is, as regular readers may recall, the science teacher at St. Marie of the Blessed Educational Method and was eager to do a little recon on behalf of Teh Children®, b) Ol’ Robbo is an absolute sucker for big screen depictions of the Grandeur of the Cosmos, full of which this short film, narrated in his gravelly Aslan voice by Liam Neeson, was nicely chocked, c) we went for Chinese afterwards, and d) none of yer damned biznay. Suffice to say, a good time was had by all. Anyhoo, the reason I mention this is that the film, although really rayther vague and surfacey, touched on a point around which ol’ Robbo has always had trouble wrapping his braims. You see, in discussing the four known dimensions of the Universe, the presentation touched on Einstein’s noodlings about the possibility of the fourth dimension – that of time – being subjected to corruption, variation and warping. Despite what his college transcripts in genetics and organic chem might suggest to the contrary, ol’ Robbo has always prided himself on possessing a certain logical, analytical, scientific side. Heck, in high school physics, there were few in my class better able to calculate, given a frictionless environment of course, exactly what force would be necessary to put a cannon ball fired at a given elevation right down the smokestack of an oncoming train traveling at a given speed. But while I can grasp, at least at some level, the bending of the physical universe in three dimensions – via gravity – and even the bending of these three dimensions relative to Time, I simply cannot fathom the bending of Time itself. In other words, I can grasp a physical phenomenon proceeding faster or slower, depending upon the conditions, easily enough. What I can’t grasp is the changing of the chronological marker against which said phenomenon is measured. Of course, I didn’t. But I had quite a good chuckle thinking about it. Still didn’t like the kid very much, tho’. Bartholomew Roberts was born in 1682 in Casnewydd-Bach, or Little Newcastle, between Fishguard and Haverfordwest in Pembrokeshire, Wales. His name was originally John Roberts, and his father was most likely George Roberts. It’s not clear why Roberts changed his name from John to Bartholomew, but pirates often adopted aliases, and he may have chosen that name after the well-known buccaneer Bartholomew Sharp. He is thought to have gone to sea when he was 13 in 1695 but there is no further record of him until 1718, when he was mate of a Barbados sloop. In 1719 he was third mate on the slave ship Princess, under Captain Abraham Plumb. In early June that year the Princess was anchored at Anomabu, then spelled Annamaboa, which is situated along the Gold Coast of West Africa (present-day Ghana), when she was captured by pirates. 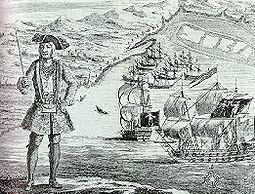 The pirates were in two vessels, the Royal Rover and the Royal James, and were led by captain Howell Davis. Davis, like Roberts, was a Welshman, originally from Milford Haven in Pembrokeshire. Several of the crew of the Princess were forced to join the pirates, including Roberts. He was killed by grapeshot in a battle in 1722 and buried at sea before his body could be captured. Or so they say. The headlines today? Good God Almighty! The bread-and-circuses crowd had better quit trying to figure out whether Ben Gazzi is that ghey linebacker or the latest Kardashian bf and wake the hell up! Numerous recent conversations with the gels, all of whom are now very much either teens or pre-teens, produces in ol’ Robbo a sense of paradox. On the one hand, the gels go to great length, each in their own fashion, to suggest that Dad is some kind of combination of dinosaur, nerd, snob, misfit and Looo-sah. The phrase, “Your problem is that you live in the 18th Century” has more than once wafted into Robbo’s shell-like. Well, what can I say? Guilty as charged. At least, that’s my perception and I’m sticking to it….